The latest in a series of guitar pedals, this one finally seems to have all a looper could reasonably require. Firstly, you get 5 seconds worth of ping pong, tape echo or delay, each of which can be frozen using a non-latching footswitch. The delay can be set in seconds, or by using a tap time button. You can also set feedback and mix in real time by going into edit mode whilst playing. On top of that, you’ve got some useful effects, such as compression, chorus, a fairly basic selection of reverbs and pitch shifts, harmoniser etc. There’s 16 amp modelling types, a noisegate and other odds & sods. The most useful extra is that the “chorus” effect can be set as a number of delay types, up to a second in length. So, you can get a loop going, then play over the top with both delay and reverb added to the live signal. My instinct would be to switch most of the effects off and use it as a simple 5 second looper, but if you’re pushed for space or have no other gear, it will just about do everything. Since you’re unlikly to be changing patches much, I’m tempted to have it on a stand at waist height for hands on twiddling, and just keep the footswitch on the floor. The interface is reasonably straight-forward, although there are little glitches – knob 1 appears to allow you to set the function of the footswitch, but it doesn’t remember it – knob 2 looks the same but actually remembers things. Took me a while to scour the manual to in this down. Having only one control input means you can’t use the delay hold whilst altering real time effects (wah etc) – it wouldn’t have cost much to have a socket for both footswitch and control pedal. 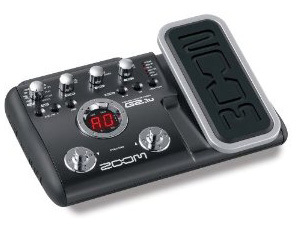 Now if zoom could simply take the existing delay options, add more impressive reverb and chorus, treble the delay time and put it in a rack, they’d have a loopers dream. Chances are, it won’t happen. The best news is, it’s about £65 if you shop around – quite unbelievable value, even if the tight sods don’t include the 9v power supply. 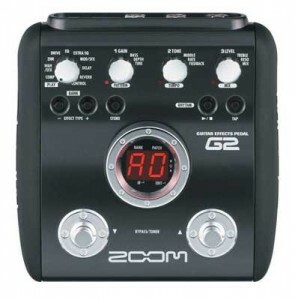 There’s also a zoom G2.1u with a built in expression pedal.